Perfect foot structure isn’t needed to walk comfortably, yet our clients do require good functional movement in several key joints to lessen wear and tear and reduce damaging knee, hip and low back compensations. Correcting these problems can be as simple as manually balancing the foot to allow increased motion in a single fixated area such as the talocalcaneal or subtalar joint (Fig 1). 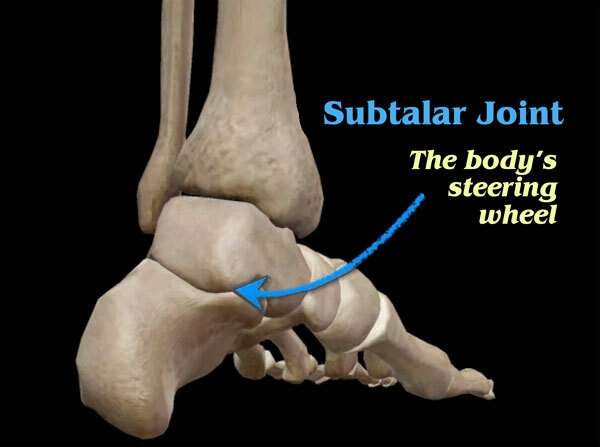 My mentor, the late Dr. Philip Greenman used to say: “The subtalar is the body’s steering wheel and the most important joint you didn’t know you had.” Located just below the ankle, where the calcaneus (heel bone) and the talus (ankle bone) meet, it primarily does only two things…roll in and roll out (Fig. 2). 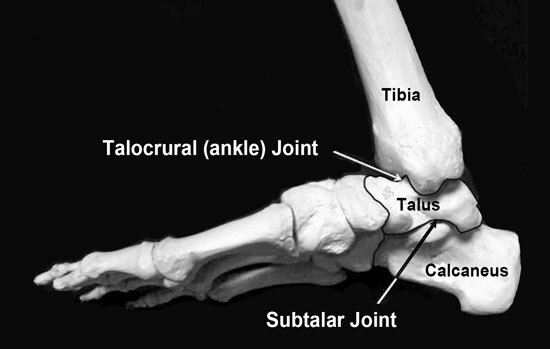 Pain from plantar fasciitis and medial shin splints often have roots in a dysfunctional talocalcaneal articulation where the talus has glided forward on calcaneus and become fixated there. Another area that commonly becomes restricted due to protective muscle guarding from ankle injuries is the talocrural joint (Fig. 3). During healthy gait, this joint should dorsiflex 15 degrees. If the ankle is restricted in dorsiflexion, the knee and hip will not fully extend. This can result in back pain from decreased hip flexor mobility and repeated extension and rotation of the lumbar spine during gait. 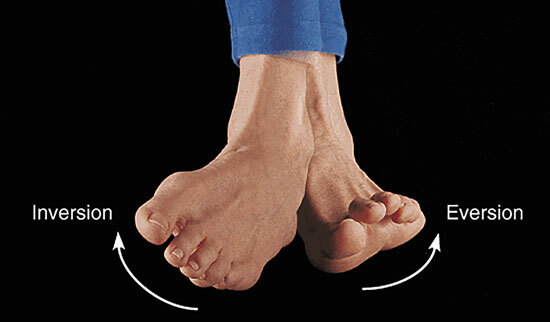 Since the mid-foot joints control motion of the foot anteriorly, clients often notice a dramatic difference in the ability to bend their toes and walk more freely when treated with graded exposure stretching techniques such as those shown in the accompanying MAT video. Fig. 2 – Inversion / Eversion… roll in and roll out. These are just a couple of examples of how a limitation in one spot can affect something else much farther up the kinetic chain. So, if your clients have foot, knee, hip or low back pain and have been struggling to get relief, try mobilizing the foot and ankle joints using these graded exposure soft tissue stretches. For home self-care, I suggest that my clients practice rocking back and forth with the feet dorsiflexed. I call this “dorsi-rocking” and it’s one the best ways to fully restore function of the feet, ankles, knees, hips, and pelvis. The act of dorsiflexing the feet while rocking has a prying effect on the posterior hip capsules, which reflexively activates the pelvic floor. This then allows the hips, pelvis, and deep abdominal musculature to maintain proper alignment and operate more efficiently when gravitationally loaded (such as in squatting and lunging). By allowing the joints to work independently, yet synchronously (the way Mother Nature intended), this simple corrective exercise enhances the hands-on myoskeletal therapy by resetting postural proprioception, improving balance and reducing foot and ankle pain.